Searching for the best in Columbus, Ohio, kids’ furniture doesn’t have to be a chore. In fact, once you have discovered all that Amish Originals Co. has to offer, shopping for furniture anywhere in the home can actually be fun. It’s time for you to discover just how rewarding a task Columbus, Ohio, furniture shopping can be. 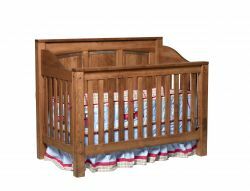 Convertible Cribs – You can’t really claim to be the best in Columbus, Ohio, kids’ furniture without offering convertible cribs. We offer several different styles in these beds that come with a conversion kit for youth and full size beds. Choose from stunning American hardwoods like brown maple, oak, cherry, maple, quarter sawn white oak, or hickory. Children’s Storage – For everything that needs storage, from toys to clothes, in your kid’s room we have got it here. Dressers, chests, nightstands, and so much more are available for you to choose from for your kid’s room. Children’s Accessories – From your baby’s first high chair to their first rocking chair, we have all of that and so much more. Once you choose the pieces you want, you then get to choose the wood as well as the finish. The handmade selections you choose truly are one of a kind and make the ideal quality family heirloom to be passed down for generations to come. You can even find some amazing selections for your home from our Clearance section. The bottom line is that you never have to settle for less than the best when it comes to furnishing your home. Whether you need a single display table or an entire home filled with furniture, we can help you make that happen. For over 20 years now we have been making customer care our number one priority. By establishing strong working relationships with over 70 Amish families within the Northeast Ohio region, we can easily help you get what you need, as soon as you need it. So next time you are debating where the best place to find Columbus Ohio kids furniture is, look no further than the Amish Originals Furniture Co. name. Columbus, Ohio’s furniture source!